The CG900 series is a delay timer available in 19 time ranges from 0.5 seconds to 30 hours. The timer uses CMOS integrated circuits for the timing function. 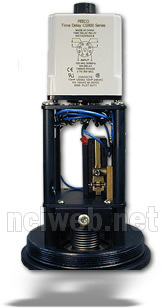 The desired delay time is set by the adjustment of a calibrated knob referenced to an index mark on the housing. 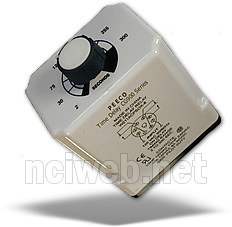 At time out, a DPDT relay is actuated for control of output loads. Available on Explosion Proof models only, any style. The CG900 timer is housed ina molded Noryl Case which provides high impact resistance and self extinguishing in case of fire or excessive heat. All external connections are made to the standard 8-pin octal relay base. An optional hold-down clamp is available for use with installations requiring horizontal mounting or exhibiting excessive vibration. Modular Time Delay used where operations require an integral unit with longer delay than the DASH POT before actuating and completing circuitry. Self-resetting timer allows delay from 0.5 seconds to 30 hours as required. The timing base for the CG900 series timer is established by a precision capacitor and the adjustable dial potentiometer. The technology utilized in the CG900 series provides accurate control over extended time ranges to 30 hours. Delay time starts upon application of power to the timer input terminals. At time out, the delay contacts transfer. Reset occurs whenever power is removed from the control input. Relay - 10 amp steady state at 120 VAC or 28 VDC. Mechanical lifetime = Over 20 million operations.